That’s nearly one a day for two months. 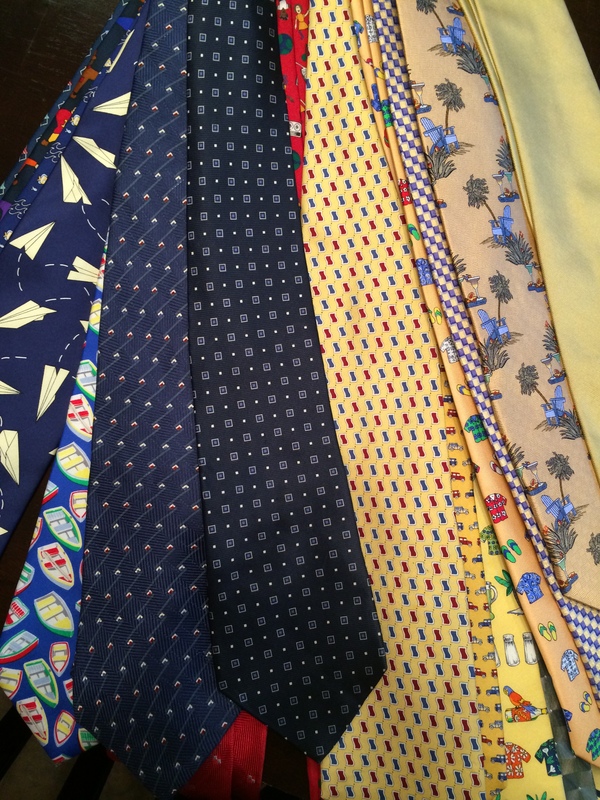 That’s enough ties for me to give one to the starting lineup for every team in the Southeast and Atlantic Divisions of the NBA’s Eastern Conference…and still have two left over. That’s one tie for each of the 50 states, plus Puerto Rico and Guam. That’s one for each of the band members in the Beatles (4), Doors (4), ‘NSYNC (5), Rolling Stones (4), Metallica (4), Polyphonic Spree (25), Cream (3), both guys from Wham! and Bob Dylan, too. I haven’t worn a tie on consecutive days in several years. I used to wear one every day, but over time, the workplace became more relaxed and “business casual” became the norm. In fact, I have only worn a tie a handful of times since starting my new job nine months ago. I wore won last week at a wedding and I’ll wear another one in three months on October 26th when I get ordained. So, why in the world do I own 52 ties? Because of excess. My goal is to sell 28 neckties. I have narrowed down which one’s I’m keeping to about 30 and will rely on my wife to help me whittle down the rest. I picked the number 24 because I have a built-in tie rack in my closet that holds exactly that amount. Seems like a good place to start. How many red ties does someone actually need? These are not legitimate reasons to stockpile things. I will have the memories. I’m fortunate to have a wonderful memory, rich with details. I don’t need a clothing accessory to help me with that. I must cut ties with my ties. And a bunch of other stuff. We are continuing to strip down the amount of things we possess as a way to strip down the car payments we send out each month. Over the last week, my envelope has grown. I started selling some of my photo prints last week. I really had no anticipation that anyone would buy them. A few years ago, on a wild hair I decided that I would be part of an art show in Lake Lure, North Carolina. I spent a few hundred dollars on matted prints, prints of various sizes, portfolios, business cards and a display in hopes of making it big. I love photography, more importantly, I love my photography. Unfortunately, others do not necessarily love it as much. Well, at least Lake Lure art goers who walk around in wet bathing suits and leave their wallets at home. So, I was overwhelmed when orders started coming in shortly after posting my matted prints on Facebook. A couple people chimed in a bit late and were disappointed that I didn’t have any more matted prints of their favorite image, but were very happy to get an unmatted photo at a reduced price. So far, these photo sales have contributed over $100 toward paying off our car. Parting with the ties is the toughest item I’ve dealt with so far, which is not saying too much. I do enjoy some of the ones I plan on selling at our yard sale next weekend, but I know that I really do not need them. As I move from room to room in our house, I completely expect the decisions to get increasingly tougher. I have some collectible items that I do not intend to sell. I have some that I do not want to sell, but know that I probably should. I’m praying for wisdom and for peace as I part with some items. As I said before, I’m a sentimental person. I keep things that mean a lot of me. I see value in everything. It’s not a gift or a curse, but something that makes me a good photographer and good pastor. I see value in items and certainly in people who may be broken or damaged. I see things for what they are worth. As I try hard to eliminate the ties to materials things, my prayer is that my desire for Christ and people to increase. In addition to the photography sales, my eBay sales have gone over $300 so far, Elizabeth has started selling some items on Facebook and we have a huge yard sale coming up next weekend. Operation “I hate my car payment” is well underway.